Sciogliete il lievito nell’acqua tiepida ed aggiungete il tuorlo e l’olio (1); aggiungete metà della farina (2) ed impastate per qualche minuto. Aggiungete il sale, l’altra metà della farina (3) e continuate ad impastare fin quando il composto sarà elastico ed omogeneo. Versate l’impasto in una spianatoia precedentemente infarinata (4); appiattite il composto con il palmo delle mani e fate una prima piega verso sinistra (5) ed una seconda verso destra (6); appiattite nuovamente il composto e rieseguite le piegature verso sinistra e verso destra (7-8). Porre l’impasto all’interno di un contenitore abbastanza capiente e precedentemente oliato (9-10), lasciar lievitare per circa 60 min. Porre l’impasto lievitato (11) nella spianatoia precedentemente infarinata (12) e servendosi di una spatola tagliare l’impasto in pezzi di circa 100 gr (13). Per fare i panini appiattite con il palmo della mano un pezzo d’impasto (14); arrotolate l’impasto su se stesso tirando delicatamente la pasta (15); arrotolate nuovamente l’impasto tenendo il seme verso l’alto e tirando leggermente la pasta durante l’operazione (16-17). Alla fine otterrete il primo panino tenendo il seme verso il basso (18); con un pennello da cucina bagnate leggermente la superficie superiore del panino e (se si desidera) spolverate di semini di sesamo (19). Eseguite lo stesso procedimento per tutti gli altri pezzi d’impasto riponendo i vostri panini in una teglia con carta forno leggermente infarinata (20). Lasciate lievitare i panini per circa 45-60 min all’interno del forno spento con la luce accesa (21) (in tal modo la temperatura interna si manterrà sui 30°C). Infornate a 220°C-230°C in forno già caldo, spruzzate un po’ d’acqua per generare vapore nel forno o mettete un pentolino di acqua bollente nel forno durante i primi 10 minuti di cottura. Cuocete per 15-20 minuti a seconda del forno (22). 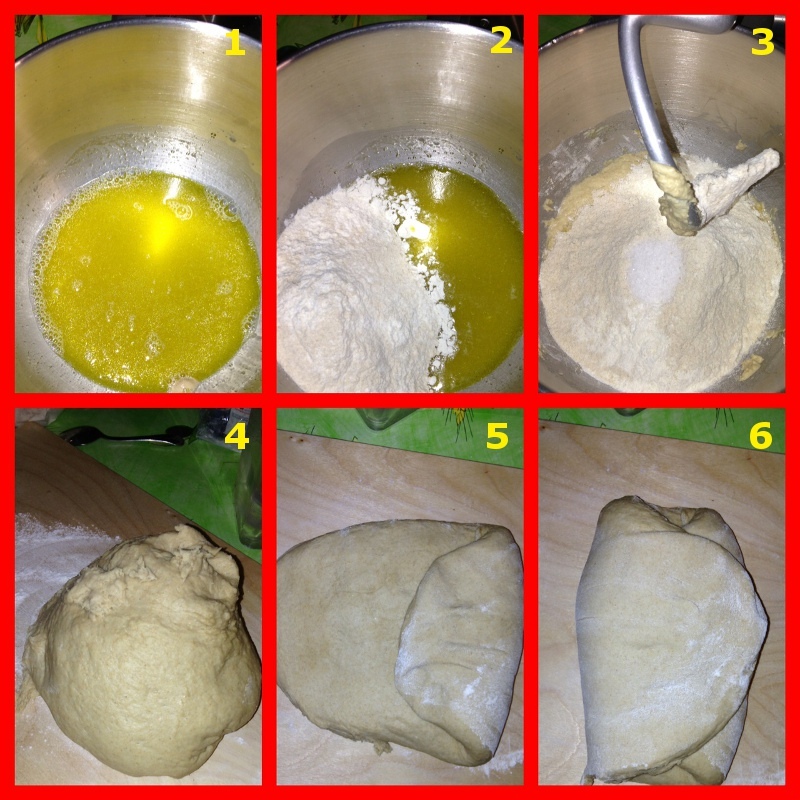 Dissolve the yeast in warm water and add the egg yolk and oil (1), add half of the flour (2) and knead for a few minutes. Add the salt, the other half of the flour (3) and continue to knead until the mixture is elastic and smooth. Pour the batter into a pastry board previously floured (4), flatten the mixture with the palms of your hands and make a first fold to the left (5) and a second to the right (6); flattened again and rerun the mixture bends to the left and to the right (7-8). 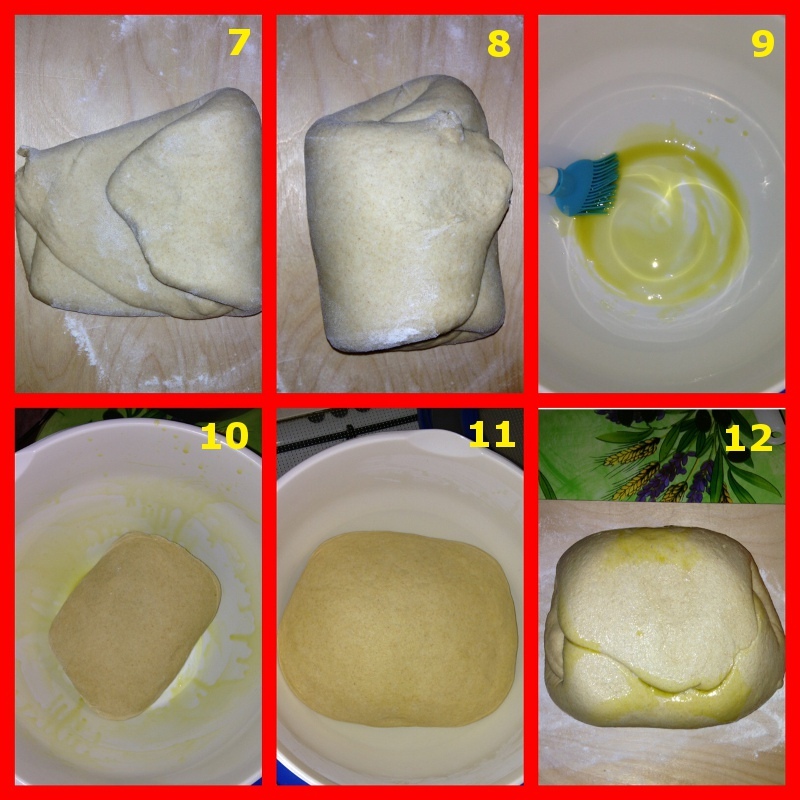 Place the dough in a container large enough and previously oiled (9-10), leave to rise for about 60 min. Place the dough leavened (11) in previously floured pastry board (12) and, using a spatula, cut the dough into pieces of about 100 g (13). 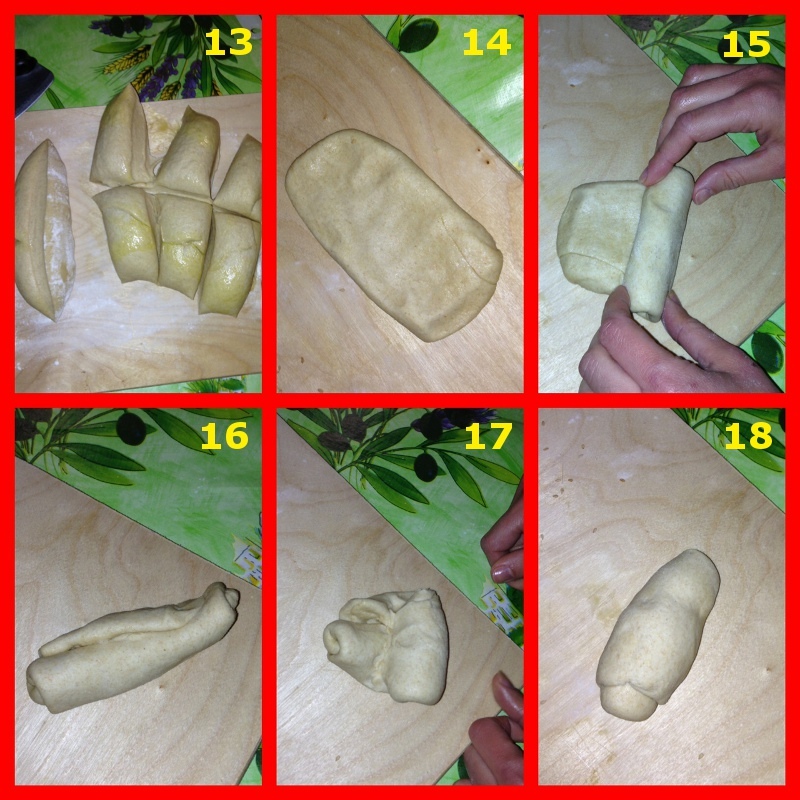 To make the sandwiches flatten with the palm of hand a piece of dough (14), roll up the dough over itself by gently pulling the dough (15), roll the dough again taking the seed upward and pulling slightly dough during the operation (16-17). At the end you will get the first sandwich holding down the seed (18), with a pastry brush lightly wet the top surface of the sandwich, and (if you wish) sprinkle with sesame seeds (19). Perform the same procedure for all the other pieces of dough placing your sandwiches on a lightly floured baking sheet (20). Let sandwiches rise for about 45-60 minutes in the powered off oven with the light on (21) (so that the internal temperature will remain around 30 ° C). Bake at 220 ° C – 230 ° C in a preheated oven, sprinkle a bit ‘of water to generate steam in the oven or put a pan of boiling water in the oven during the first 10 minutes of cooking. 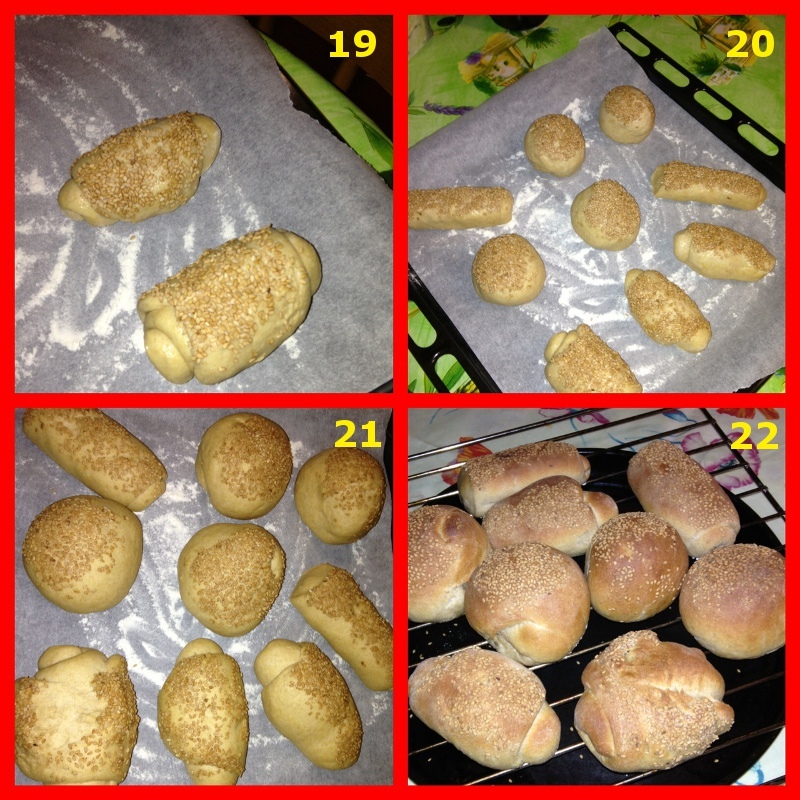 Bake for 15-20 minutes depending on the oven (22). 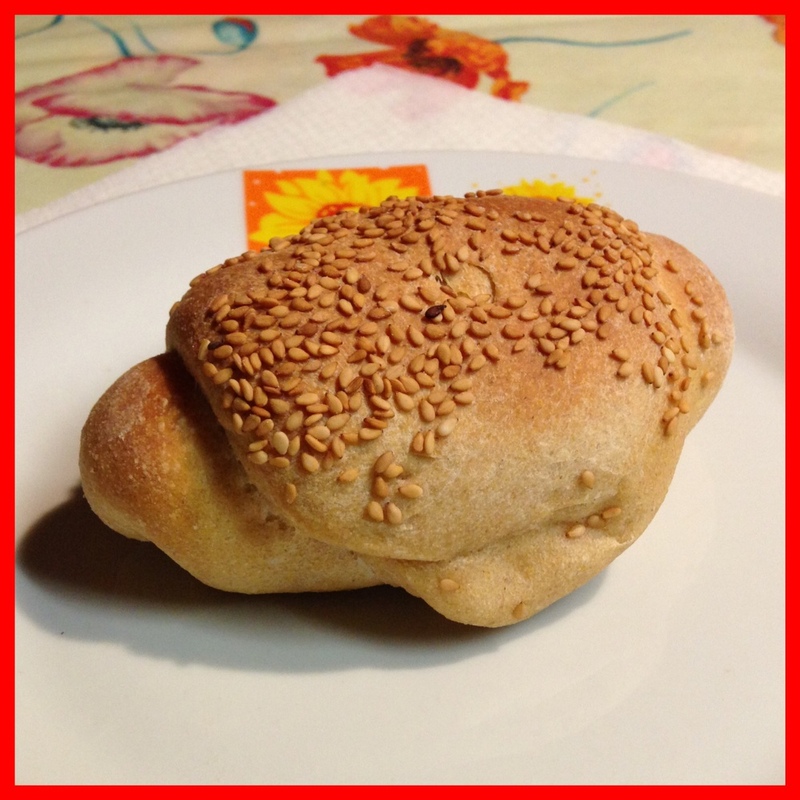 This entry was posted in Panificazione - Bread making and tagged bread, panini, sandwich. Bookmark the permalink.